Narec installed a biomass boiler at its former high voltage testing laboratory in Hebburn to help reduce annual energy costs and carbon emissions. The conventional gas boiler which had previously been the primary source of heating a 40m high test facility generated annual energy bills of £60,000. Narec Distributed Energy conducted a technical feasibility study in order to determine the most suitable technology for the application, the long-term objective was to reduce its energy demand, carbon emissions and effectively demonstrate the application of low carbon technologies. Narec Distributed Energy evaluated various heat distribution systems and conducted an assessment of the facility. As a result of the study a 500kW Binder biomass boiler was selected as the primary heat source, with heat distributed via a series of air handling units which disperse the heat directly to the high voltage test equipment using jet diffusers. A close control system has also been installed to ensure optimal performance and to protect the test equipment from under or over-heating. 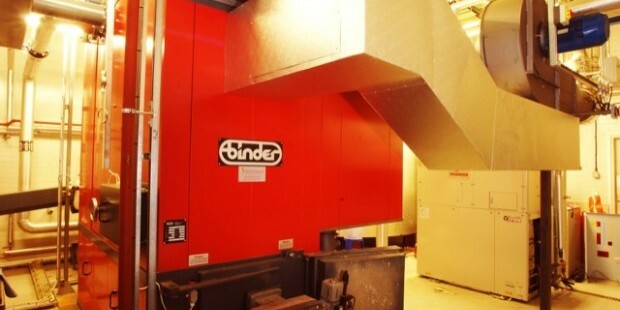 The Binder boiler was installed in a refurbished plant room with 10,000 litres of thermal storage, and a user friendly display panel fitted to improve monitoring of system performance. Fuel is stored in two walking floor hook bins which are located adjacent to the plant room, with fuel delivered to the boiler via a screw auger. The new biomass boiler took up no more room than the original boiler, and was fuelled by wood chips from local suppliers. Biomass proved an ideal renewable alternative for the heating of Narec's laboratory because of the readily available local supply of wood-chip fuel. The boiler will also allowed Narec to eliminate the financial risk of rises in fossil fuel costs, and reduce its carbon emissions by over 700 tonnes. The biomass heating system also reduced the facilities annual fuel bill by £25,000. In addition to the 500kW biomass boiler, two 10kWe Yanmar micro-CHP units were installed.